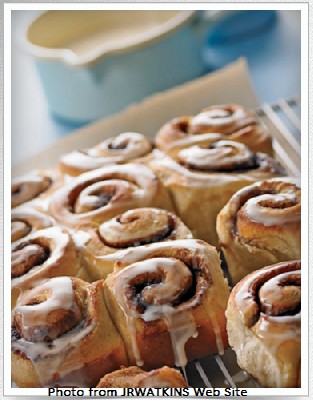 Homemade Cinnamon Rolls as featured on the Watkins Products Catalog! here`s the Homemade Cinnamon Rolls Recipe! Combine 1-1/2 cups/375 mL of the flour and yeast in large mixing bowl. Heat the 1-1/4 cups/325 mL milk, vanilla, sugar, butter, salt, and cinnamon just until mixture is warm (120-130°F/50-55°C), stirring constantly. Add to flour mixture along with eggs. Beat with an electric mixer on low speed for 30 seconds; scraping sides of bowl constantly. Beat on high speed for 3 minutes. Using a spoon, stir in as much of the remaining flour as you can (dough will be soft). Knead in enough of the remaining flour to make a moderately soft dough (3 to 5 minutes total). Shape dough into a ball; place in a lightly greased bowl, turning once. Cover and let rise in a warm place until double in size (about 1 to 1-1/2 hours). (The dough is ready for shaping when you can lightly press two fingers 1/2-inch/1-cm into dough and an indentation remains.) Punch down dough and divide in half. Place each half on lightly floured surface and smooth into a ball. Cover and let rest 10 minutes. On lightly floured surface, roll half the dough into a 12 × 8-inch/30 × 20-cm rectangle. Spread with 3 tbsp/45 mL of the butter. Combine brown sugar and cinnamon; sprinkle half over rectangle. Roll up from short side. Seal edges (brushing with water makes rolls easier to seal). Repeat with remaining dough. Slice one roll into 8 pieces and the other roll into 7 pieces. Arrange slices, evenly, cut-side up, in greased 13 × 9-inch/33 × 23-cm baking dish. Cover and let rise until nearly doubled (about 30 minutes). Bake at 350°F/180°C for 25 to 40 minutes or until light brown. Invert at once onto wire rack, invert again. Cool slightly. Drizzle rolls with a glaze made by combining the powdered sugar, vanilla, and milk. Serve rolls warm or store in an air-tight container.